It was a busy week trying to finish the baby dress and pattern. I was so proud of myself for really making headway on the dress when I noticed (after knitting 5"), that my calculations for the pleats were for knife pleats, not box pleats so I had to start again. It has been so humid here that the yarn I ripped out straightened out almost immediately and was a good as new. 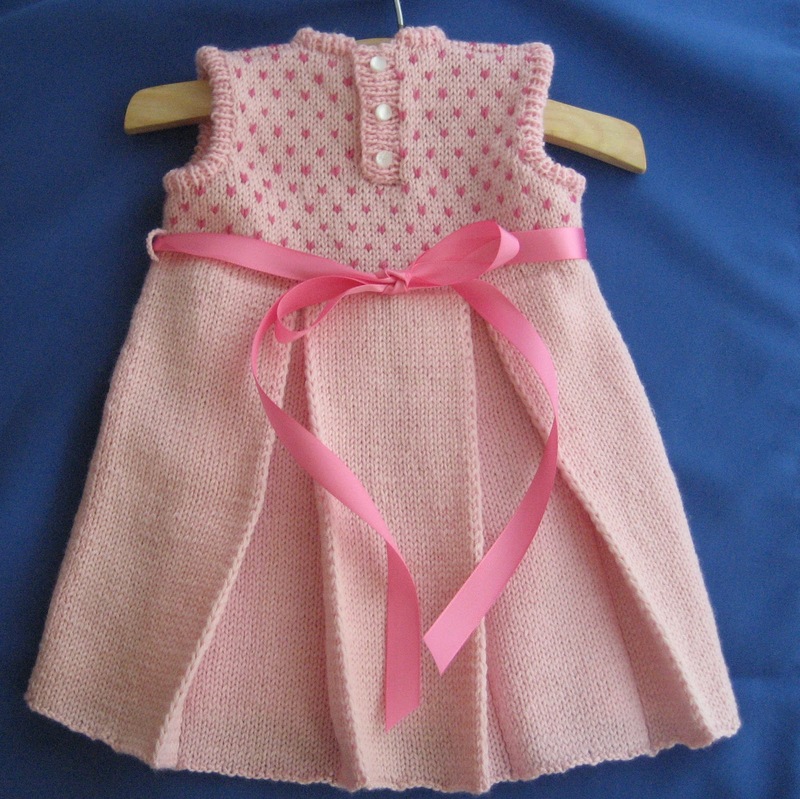 The pattern writing went much smoother than the knitting! I must say that the dress is unbelievably cute. I spent another day writing a finishing article. We've added a new series of articles to Cast On (starting with the Fall issue) on finishing. I used Rowan Pure Wool Aran for the samples. It is lovely so I will use it for the rest of the articles as well. Westminster is sending me a box. I won't be doing an entry next week. I will be in Colorado and Utah. I am looking forward to the low humidity. Not many lessons arrived this week. It is funny how my students instinctively know when to send work. I spent the bulk of the week chained to my computer working on patterns. I received an update from Lola on her sweater for the Swatch to Sweater class. She is finishing up the back and will be ready to begin the front. Back in January I started plans to do another correspondence course but when I inherited the Swatch to Sweater class I had to put it on hold. For the past few years I have been teaching a class on gauge )(how to calculate it and how to use it to modify and create patterns). I think this would work better as a correspondence course. I have some time now to put my ideas together. Gauge isn't fun but it is necessary and it makes designing much easier. This tip doesn't apply to everyone. Frequently (more frequently than you might think) I get a lesson to review where the swatches have twisted stitches. I'm not talking about just a twisted stitch here or there but where every stitch on a row is twisted. I've had students who want to know why this is a problem. Well, if you ever want to use a pattern and have the garment turn out, you have to fix this. Twisted stitches are smaller than the untwisted version so they will have a different stitch and row gauge. You will have to use much larger needles to even come close to the expected gauge. The resulting fabric will be very lacy particularly when stretched side to side. How do stitches get twisted? 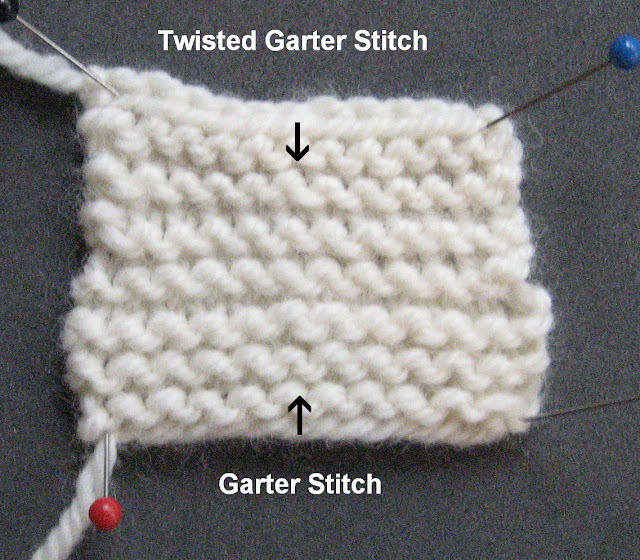 There are two ways to twist a stitch. If you knit or purl the stitch through the back rather than through the front, it will twist the stitch on the needle. If you wrap the yarn around the needle in the opposite direction (over the needle for a knit stitch or under the needle for a purl stitch ) when making a new stitch, you will twist the stitch on the needle. When I get a lesson that has twisted stitches, the first thing I do is to see if it has twisted stitches on every row. If stitches are twisted on every other row and there are no twisted stitches on the garter stitch swatch, I know the problem is with the purl rows. If the garter stitch is twisted but the stockinette is twisted every other row, I now the problem is with the knit rows. 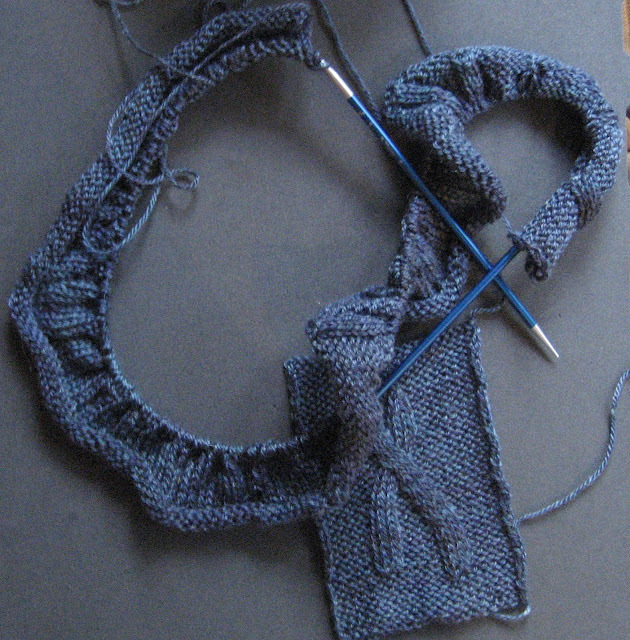 If every stockinette row is twisted, both knit and purl rows have a problem. 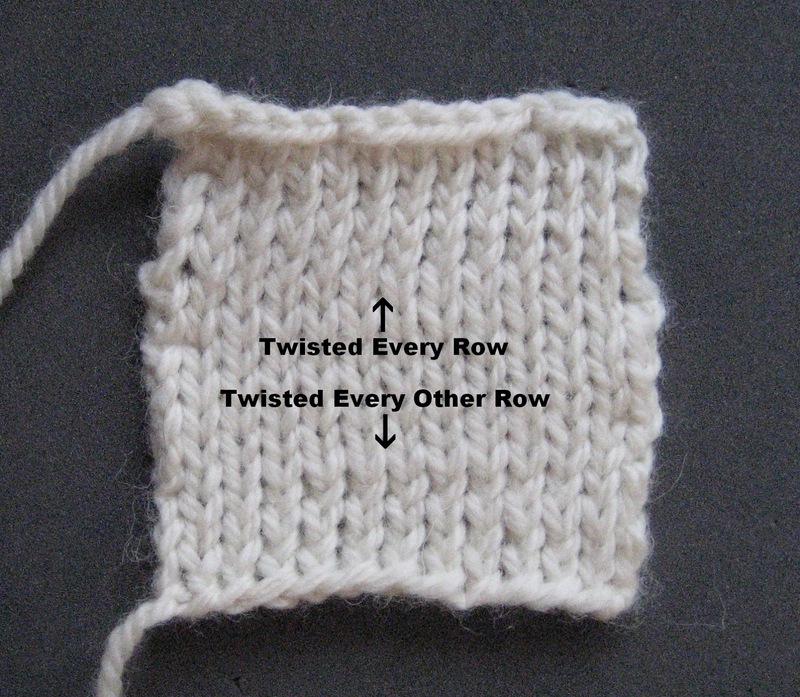 As you can see in these photographs, the twisted stitches are smaller than regular stitches. If you aren't sure if there is a twisted stitch, stretch the piece from side to side. Twisted stitches will be crossed at the base. The good news about twisted stitches is that it is a very easy problem to fix. 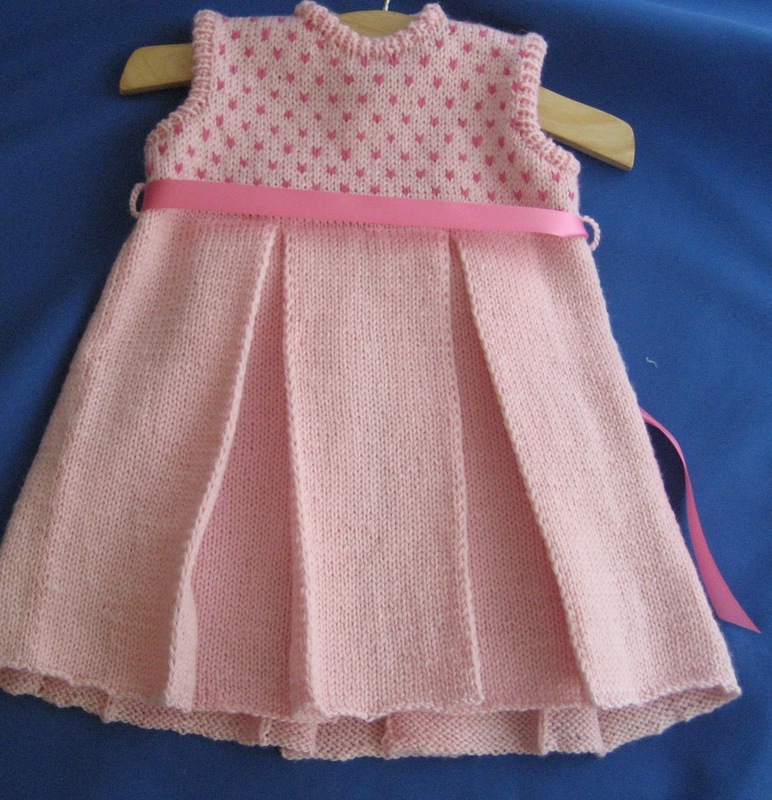 You just have to work the stitches through the front or wrap them in the traditional way. In every case where I have had students who do this, they have been very successful in making the change. Sometimes you may want to intentionally twist stitches on the needle as a way to fix a tension problem. In the upcoming weeks my tips will concern tension and I will discuss it then. Salon will be on Saturday. One of the things I did last weekend was to go through all of my knitting books again. When it took me 45 minutes to locate a book I needed, I knew it was time. I now have stacks of books on my dining room table. I hope everyone takes a few. The rest will go to the Friends of the Library. I have finished up everything for the winter issue of Cast On. Since the photo shoot isn't until August 14th I am way ahead of schedule. The baby dress turned out better than I had planned. I photographed it hanging at first but you can't see the pleats. The bow makes all the difference in the cuteness factor. 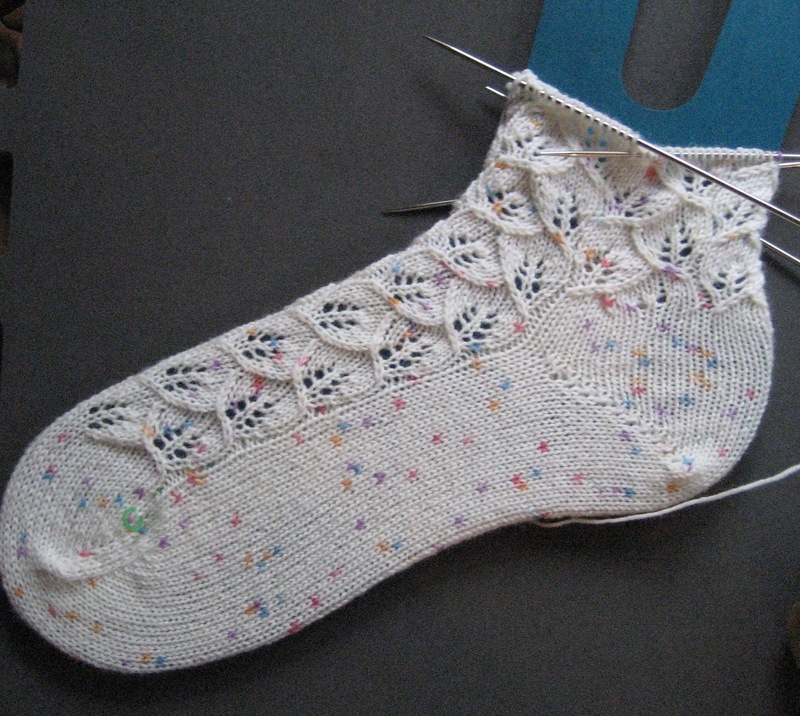 Now that I have some time I decided to make myself a pair of socks from yarn I have had for years. I never made myself a pair with the Leaves of Spring pattern I did a few years ago and I thought this yarn might work. I love this stitch pattern. I found it in Gisela Klopper's book but I made some modifications to it to close off the leaves at the bottom. I decided to use the Briar Rose yarn I bought at the Kentucky Fiber Festival before I forget I have it. I wanted to do a Medusa's jacket for me. The one I did for Cast On a few years ago was red. I want mine to be blue. The Briar Rose is 50% merino and 50% tencel. I did a swatch to test it out first and it will be perfect. The tencel makes it lighter. It blocked well and I think the snakes will show up even in this dark color. I like the shine as well. I would really love to finish this in time for the conference in Reno but we shall see how that fits in with my schedule for Cast On. The next Fashion Framework is on skirts and it looks like I will be doing it. First pleats, now skirts! What were we thinking! Both require so much knitting! This yarn would actually work well for a skirt....hmmm.